Marcus Antonius Gordianus Sempronianus Romanus Africanus was Roman Emperor for one month with his son Gordian II in 238, the Year of the Six Emperors. During the reign of Alexander Severus, Gordian became governor of the province of Africa Proconsularis. 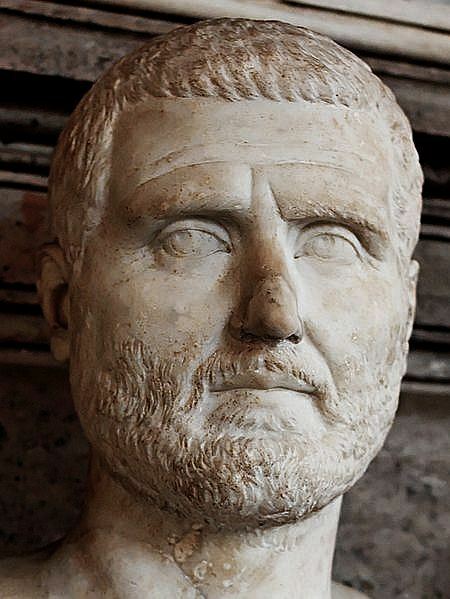 When Maximinus Thrax killed Alexander Severus and assumed the throne, a tax revolt broke out in Africa - and Gordian was forced to assume imperial honours or perish. Opposition would come from Numidia, where the governor was a loyal supporter of Maximinus Thrax and held a grudge against Gordian. He invaded Africa Proconsularis with the only legion stationed in the region. After a brief struggle, both Gordian I & II were dead.